Swallows, swifts, and martins are beautiful, graceful birds that are highly desirable backyard visitors, but they are not typical backyard birds. Because of that, attracting swallows can be a challenge even for experienced backyard birders with many feeders and a variety of backyard guests. Understanding these birds' unique needs is the key to learning how to attract swallows and enjoy the benefits of having these beauties in your yard. Swallows are attractive backyard birds for several reasons. Their graceful, aerobatic, energetic flight can be a joy to watch as they swoop about, and their glossy plumage glitters in the sunlight. They are relatively quiet species, and while their song is typically musical and chirping, they are less vocal than species such as thrushes or mockingbirds – perfect for backyard birders who prefer a quiet landscape. The most desirable characteristic of swallows, swifts, and martins, however, is their voracious appetites. These insectivorous birds can consume hundreds of insects every day - from moths to mosquitoes - and inviting a family of them into the backyard can provide exceptional (and free!) pest control. Any of these swallow species would be a welcome guest in a birder's backyard, but those yards need to be swallow-friendly before the birds feel at home. The key to attracting any specific type of bird is to meet that bird's unique requirements for the basic needs of survival: food, water, shelter, and nesting sites. For swallows, those requirements can be a bit different than other typical passerines and more familiar backyard birds. Food: Swifts, swallows, and martins almost never visit bird feeders, no matter what food is offered. So what do swallows eat? These are insectivorous birds and preserving healthy insect populations is essential for them to have an adequate food source. Avoiding insecticides and pesticides is the first step, and areas of open grass should be large enough to allow the birds to skim low over them while feeding. Leaving grass slightly longer will encourage more insects for the birds to feed on. Some birders have had limited success offering mealworms for swifts and swallows to eat, but it takes a great deal of time and effort to get the birds accustomed to that unusual food source. That effort may be better spent fostering natural insect sources the birds are more familiar with. Water: These birds typically stay near natural water sources, and a nearby lake, large pond or broad stream is essential for them to drink. As they fly over the water, they skim the surface to dip their bills in for a drink instead of perching to sip. Moving water is more apt to attract swallows, swifts, and martins to backyards with noise and sparkles, and a bird bath fountain, bubbler or mister can be effective in attracting their attention. They may visit larger bird baths, and will often fly through sprinklers or misters for a quick, cool dip. Shelter: While many backyard birds need extensive trees, bushes, and thickets to feel safe and secure, these aerial birds are quite distinct in that they prefer more open areas. They are agile fliers and will soar and dive around yards that have smooth curves and open space. Providing perching spots on wires, clotheslines or antennas will encourage them to stay nearby. Nesting Sites: Many types of swallows, swifts, and martins are cavity-nesting birds, and they will readily nest in birdhouses or specialized gourds. Leaving dead trees with old woodpecker holes intact will provide additional nesting sites. 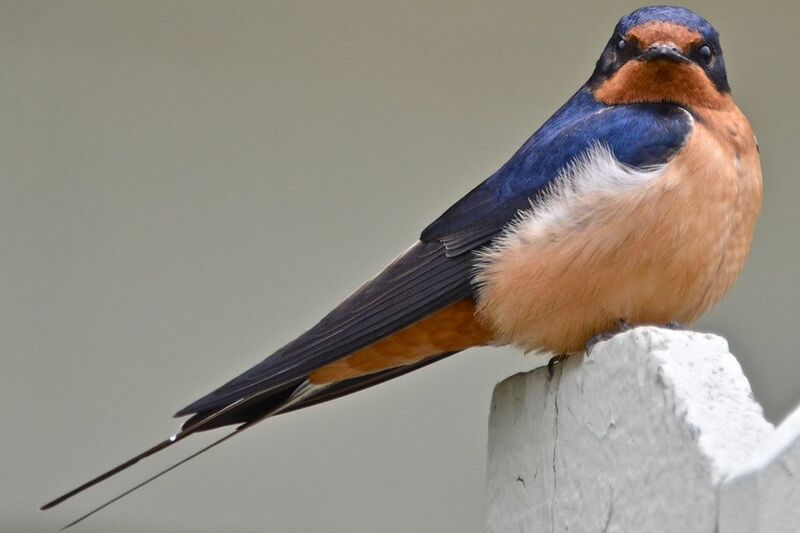 Some swallow species, such as barn swallows, will build their cup-shaped nests in sheltered areas under eaves on porches and decks or along roof lines. A muddy puddle – perhaps under a gutter downspout or in a sheltered location in the yard – will provide good nesting material to encourage the birds to raise their families in the neighborhood. Removing large trees to provide more open space and more grassy areas for the birds to fly over while feeding. Adjusting lawn watering schedules as much as local ordinances may allow providing a fly-thru water source for the birds. Putting up wires or a wire antenna high across the yard or roof to provide additional perches with good visibility for birds and birders alike. Adding a nesting shelf under porch eaves to provide a safe, stable place for these birds to build their nests. Patience is essential for attracting swallows, and over time, if you meet all these birds' unique needs, you will be rewarded with their elegant and graceful company.